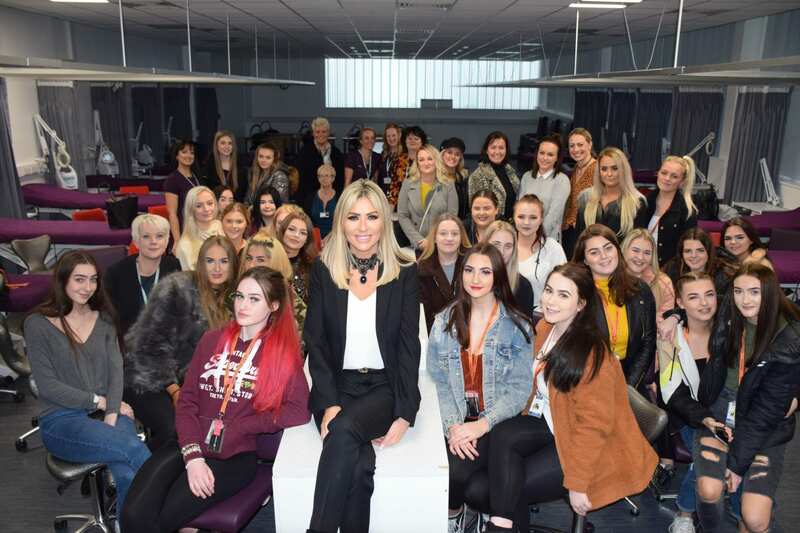 A Real Housewives of Cheshire star inspired students and salon owners on a visit to Nelson and Colne College with her talk on business, beauty and believing in yourself. Dawn Ward, one of the British aesthetic industry’s leading ladies and founder of Skulpt, gave a motivating speech to students from Nelson and Colne College, Accrington and Rossendale College and local salon owners on her journey in business and the skills required to succeed. Visiting the college with Dawn were also staff from her Skulpt Academy, who showcased examples of the latest trends covering Levels 2-4 beauty therapy, spa, massage and make-up. Sophie Hill, 16, who is on the Level 2 Pre-Apprenticeship programme at Nelson and Colne College, said: “It was a really good session and it was interesting to hear how Dawn has made it herself. I enjoyed the demonstrations as well and how they used the different palettes and blushes. Nelson and Colne College is the number one college in the country for 16-18 learner achievement and is number one in the area for vocational courses, based on progress scores. NCC also has a career college ethos that aligns students with industry, meaning they are work ready when they finish their course. Claire Pye, Head of Division for Hair, Beauty and Hospitality at Nelson and Colne College and Accrington and Rossendale College said: “The opportunity for Dawn and the staff from Skulpt Academy to come and deliver the session at College was incredibly beneficial to our learners. “Dawn’s success story was a great motivation for our students and the Skulpt staff’s demonstrations of techniques were high level, current and relevant, and it was a brilliant chance for students to see these up close. Dawn Ward said: “The college is one of the best I have attended and the students are so lucky to have such fantastic and high quality facilities. “It was an exciting afternoon being able to inspire the students and give them an insight into the skills needed in the aesthetics industry. Nelson and Colne College has been rated as Outstanding by Ofsted since 2005 and is also the best college in Lancashire for student satisfaction, according to the FE Choices Learner Satisfaction Survey. For more information about Accrington and Rossendale College visit www.accross.ac.uk or call 01254 389933.